The Doctor explains what a bootstrap paradox is to the audience. He uses the example of a hypothetical time traveller who travels back in time to met Beethoven but upon arriving finds that Beethoven never actually existed. That time traveller then decides to publish Beethoven's music himself, and thereby becomes Beethoven. Returning to the timeline set up in "Under the Lake," the Doctor, Bennet, and O'Donnell have arrived at the Army base in 1980 before it was flooded. It's the day the spaceship will land. The Tivolian Prentis is there and still alive, but the writing has yet to be scratched into the wall. Prints tells them that the spaceship is a hearse carrying a dead conqueror known as The Fisher King. Clara is still in the future with future with Cass and Lun. They realise that the Doctor's ghost is saying their names instead of coordinates like the other ghosts. The Doctor calls and is upset to learn of his fate. 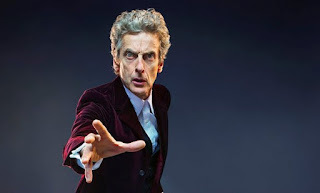 Clara pushes him to change the future but the doctor says that he can't fight his future. He tries to get information from his ghost but it ends up unlocking the Farady cage and releasing the other ghosts inside of it. In 1980, we learn that the Fisher King is actually still alive. It writes the words into the ship's wall, kills Prentis, and takes the statsis chamber away before proceeding to chase after the Doctor and the others. When running away, they get separated and O'Donnell gets killed by the Fisher King. The Doctor shares how the list of names his ghost was repeating was the order in which the crew members will die. Clara will be next and so the Doctor tries to leave to save her but is unable to do so because the TARDIS won't let him interfere with that time stream. Instead he goes back half an hour and both he and Bennett are not to interfere. O'Donnell's ghost appears in the future and steals Clara's phone, leaving her unable to contact the Doctor. Clara then realises that Cass had kept Lunn from entering the ship, he never saw the writing on the wall so the ghosts will not attack him. He goes to try to get the phone back but the ghosts end up locking him into the main room, prompting Clara and Cass to head out in search of him. The Doctor confronts the Fisher King, who states that his ghosts will signal an armada that will unleash themselves on Earth. The Fisher King goes on to taunt the Doctor for not altering the future but the Doctor replies by chiding him for all the lives he has taken. The Doctor baits the Fisher King back into the spaceship by lying about having erased the writing on the wall. The Doctor has used a power cell to destroy the damn wall and in turn flood the town with the Fisher King being swept away. The TARDIS' security protocol activates with Bennett still inside of it, but the Doctor is not to be found yet. Clara and Cass get trapped in the hang with Lunn and it's then that the stasis chamber opens and the Doctor climbs out. The Fisher King is heard roaring and the ghosts follow the sound but then find themselves trapped inside the Faraday cage. Next, the Doctor's ghost is revealed to be a hologram that the Doctor was in control of using his sonic glasses from inside the stasis chamber. The Doctor tells the group that UNIT will come to cut away the Faraday cage from the base containing the ghosts and then erases the memory of the writing from everyone's minds. Bennett convinces Lunn to admit his love for Cass and she happily reciprocates. The Doctor and Clara leaves in the TARDIS and the Doctor explains that the order the people would die after O'Donnell was purely fictional, a device simply orchestrated to make him act in the way that he should. Clara wants to know how he knew what to make his ghost's hologram say and he responds that he only kneww what he had to do because he found out through her telling him what it was already saying from the future, thus creating a bootstrap paradox. Doctor Who airs on Saturday nights on BBC One.